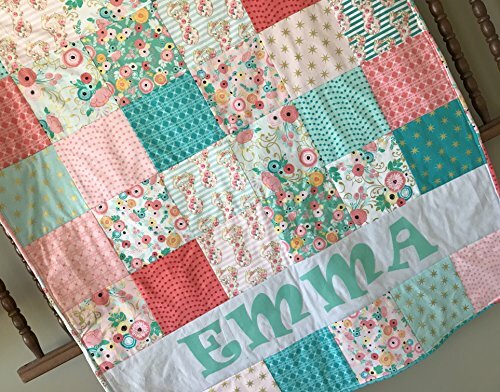 This modern baby girl quilt features a bohemian woodland theme with deer and floral prints in teal, mint and blush pink. It measures approximately 36" x 42". The quilt top is secured to a layer of Warm and Natural batting and soft coral Minky via a quilt as you go method to create a really soft, cuddly blanket. The name of your choice is also added with a rough edge style of applique for personalization. The edges will fray slightly over time for a soft, comfy appearance. The entire quilt is machine bound for durability! The quilt is handcrafted in my country, smoke-free, and pet-free home. It can be machine washed on your washer's gentle cycle using cold water. Hang dry. If you have any questions about this product by Mickey's Creations, contact us by completing and submitting the form below. If you are looking for a specif part number, please include it with your message.